If Terrorists Targeted Russia, Who's Behind the Terrorists? 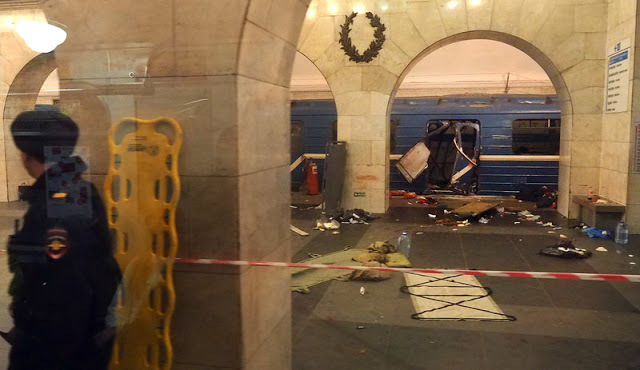 April 5, 2017 (Tony Cartalucci - NEO) - Eleven have been killed and dozens more injured in what is an apparent terrorist attack on St. Petersburg's metro system. Western analysts are assigning possible blame for the attack on either terrorists operating from Russia's Chechnya region, or possibly terrorist groups affiliated with fronts fighting in Syria. So who is to blame? No one has said officially. The BBC's Frank Gardner says suspicions will centre around Chechen nationalists or an Islamic State inspired group wanting payback for Putin's airstrikes in Syria. Or it could be a combination of both. Putin has in the past justified crackdowns on civilian protests by citing the terror threat. But will he this time, and will it work? At least one pro-Kremlin commentator has linked the attack to the recent mass demonstrations organised by Putin's political opponent. Yet, in reality, the demonstrations and the terrorist groups being implicated both share a significant common denominator - both are openly long-term recipients of US-European aid, with the latter group also receiving significant material support from US-European allies in the Persian Gulf, primarily Saudi Arabia, Qatar, and the United Arab Emirates (UAE). US-European support for foreign-funded organizations posing as "nongovernmental organizations" (NGOs) running parallel efforts with terrorist organizations undermining Moscow's control over Chechnya have been ongoing for decades. 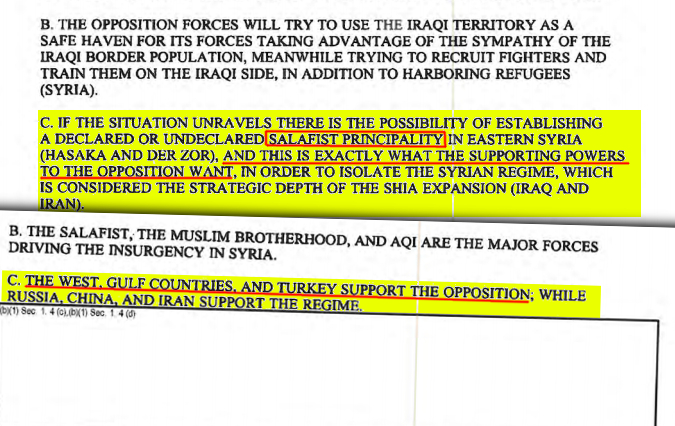 In essence, the "Salafist" (Islamic) "principality" (State) was a creation of the US in pursuit of its attempted regime change agenda in Syria. The current, self-proclaimed "Islamic State" is situated precisely in eastern Syria where the DIA memo claimed its state sponsors sought to place it. Its role in undermining Damascus and its allies' attempts to restore peace and order to the Syrian state is obvious. 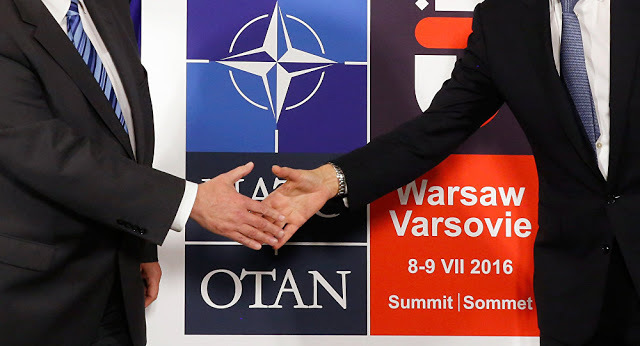 The fact that NATO-member Turkey served as a logistical, training, and financial hub for not only the Islamic State's activities, but also other terrorist groups including Al Qaeda's regional franchise - Al Nusra - also further implicates not only possible Al Qaeda and Islamic State involvement in the recent St. Petersburg blast, but also these organizations' state sponsors - those who "support the opposition" in Syria. Whether the United States played a direct role in the St. Petersburg blast or not is inconsequential. Without the massive state sponsorship both Washington and its European and Persian Gulf allies have provided these groups, such global-spanning mayhem would be impossible. 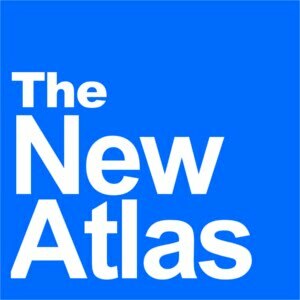 The fact that the US seeks to undermine Russia politically, economically, and in many ways, militarily, and has recently fielded US-European-funded mobs in Russia's streets - means that it is likely not a coincidence violence is now also being employed against Russia within Russian territory. January 12, 2017 (Ulson Gunnar - NEO) - As the US media expertly divides the American public into pro and anti-Trump camps over cartoonish, unfounded personal accusations aimed at President-elect Donald Trump, Trump's nominee for US Secretary of State, Rex Tillerson confirmed before the US Congress that hostilities and agitation toward both Moscow and Beijing will only expand over the next 4-8 years. CNN distanced itself from BuzzFeed on Wednesday after the digital news outlet published a document that contained unverified claims about President-elect Donald Trump's campaign conduct and personal life. "We [CNN] made it clear that we were not publishing any of the details of the 35-page document because we have not corroborated the report's allegations," the statement continued. Were headlines not consumed by the crass allegations pushed across the Western media aimed at Trump, and the rhetorical backlash that predictably followed, the American public might be consumed instead by the fact that Trump's nominee for US Secretary of State just confirmed that quite literally nothing is going to change as Trump takes office in regards to US foreign policy. 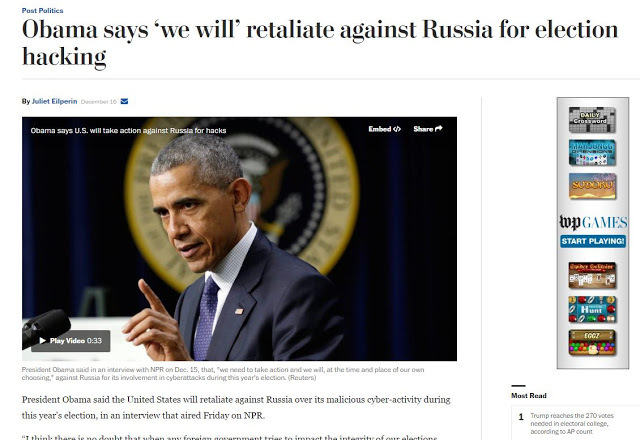 January 5, 2017 (Joseph Thomas -NEO) - The United States has recently claimed the expulsion of 35 Russian diplomats from US territory as well as additional sanctions against the Russian state are in retaliation for what the Washington Post claims is "2016 election interference." The "damaging information" that was leaked, however, was disseminated by Wikileaks, and likely the result of an internal whistle-blower, not Russian operatives. Questions surrounding the veracity of America's claims are owed to a substantial lack of evidence provided by US departments and agencies involved in both the investigation and the punitive measures applied in its wake. 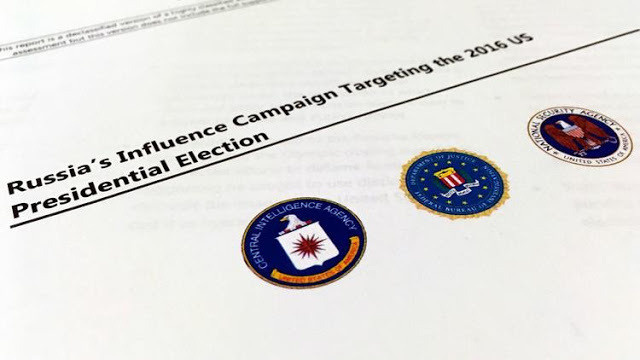 However, the US' reaction to what it claims is "2016 election interference" could significantly backfire, since the US itself is engaged in very real, overt election interference globally, and for decades. 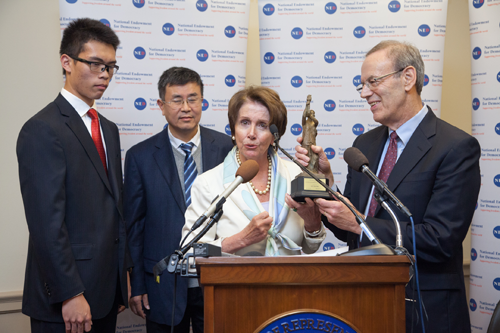 In fact, even as the US berated Russia for allegedly interfering in America's internal politics, its own organisations, including the National Endowment for Democracy (NED), funded by the US government, openly admitted they were leaking information regarding China's internal politics in efforts to undermine Beijing. 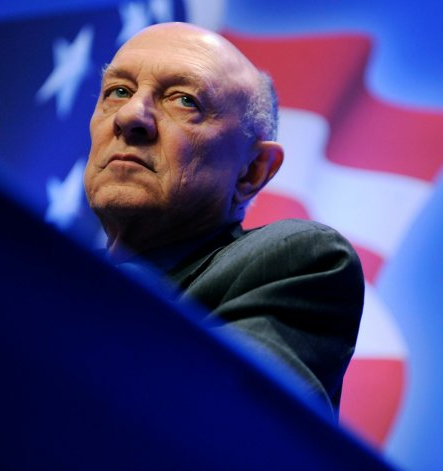 In fact, NED and its subsidiaries (including the National Democratic Institute (NDI), the International Republican Institute (IRI) and Freedom House) as well as myriad fronts around the world these organisations fund, support and direct, are openly dedicated to manipulating foreign elections, creating US-friendly opposition movements and even overthrowing governments that impede US interests worldwide. US interference across the Middle East and North Africa (MENA) in 2011 would eventually lead to regional war, the complete destruction of Libya and near destruction of Syria as well as regime change in a number of nations including Tunisia, Egypt and Yemen. December 26, 2016 (Joseph Thomas - NEO) - Despite a concerted backlash against what US political leaders and policymakers claim is Russian interference in America's internal politics, the US continues to openly interfere in the internal politics of other nations worldwide, including most recently, China. 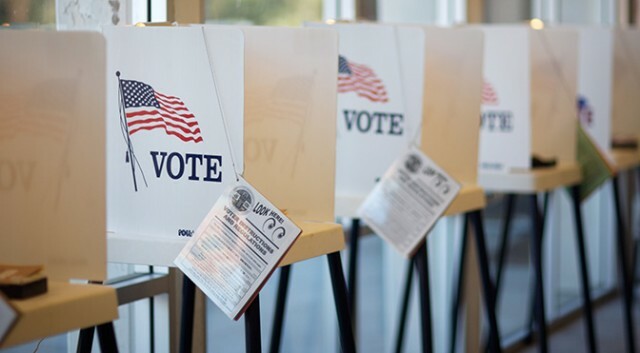 In an effort to redirect attention and blame for America's unravelling political fabric, the US political establishment and its media has spent an inordinate amount of time blaming Russia for allegedly "hacking US elections" by infiltrating the Democratic National Committee (DNC)'s e-mails. The fallout from the revelations has included a media blacklist targeting what is called "fake news," or, any media outlet that opposes narratives established by Washington, particularly regarding the contents of the leaked e-mails. 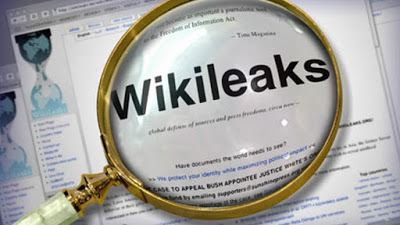 It also resulted in claims that Wikileaks (who published the leaked e-mails) was intentionally mixing fabricated e-mails in with genuine DNC data, the Intercept would report. December 23, 2016 (Ulson Gunnar - NEO) - In the week leading up to the brazen, cold-blooded murder of Russian Ambassador Andrei Karlov in Ankara, Turkey, the United States repeatedly and publicly threatened "retaliation" against Russia for allegedly "hacking" the 2016 US presidential elections. While the Western media has since attempted to dismiss murmurs across Russian and Turkish media in the aftermath of Ambassador Karlov's assassination implicating US involvement, they simultaneously appear incapable of concealing what can only be described as delight over the tragic attack. The Washington Post is able to refrain from openly applauding the assassination, but does everything in its power to legitimize, even defend it within the context of an angry "police officer" provoked by what the Washington Post calls Russia's "indiscriminate attacks on civilians." Relegated deep within the article and beyond the attention span of most readers, are details that reveal Ambassador Karlov's attacker as a participant in organized terror. 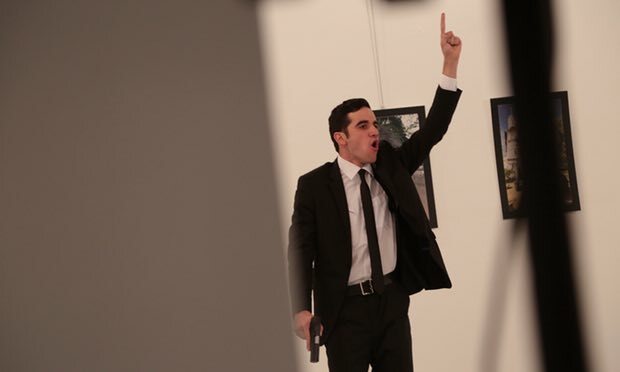 December 20, 2016 (Tony Cartalucci - NEO) - Just days after the liberation of Syria's northern city of Aleppo, Russia's ambassador to Turkey, Andrei Karlov, was gunned down while giving a talk at an art gallery in Turkey's capital of Ankara. The attack coincided with an alleged security incident near America's embassy in Ankara, characterized by the US Embassy as a "shooting," though it may be in reference to the actual assassination. 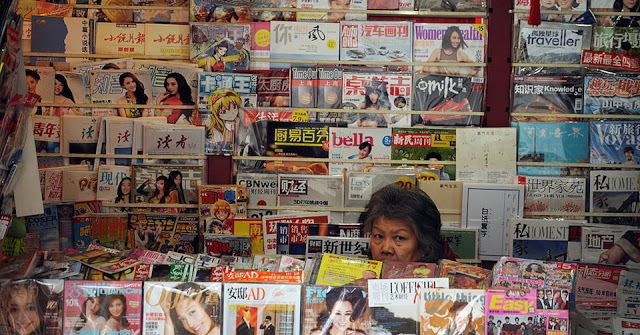 Western newspapers, however, including the Daily Mail, the UK Express, and The Sun attempted to portray the announcement as a separate incident. This may be a deliberate attempt to portray the US as a victim in tandem with Russia, to divert suspicion away from US involvement. US President Barack Obama, US policymakers and pundits, as well as US Senators for the past week have vowed "retaliation" against Russia for alleged "hacking" during the 2016 US presidential election. These threats take place against a wider backdrop of increasingly unhinged outbursts made by Western politicians, pundits, and policymakers amid frustration in advancing their global agenda versus a reemerging Russia and a rising China. Barack Obama has warned that the US will retaliate for Russian cyberattacks during the presidential election. 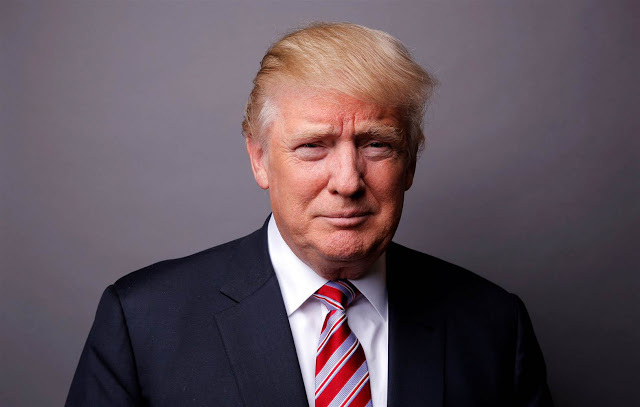 In an interview on National Public Radio on Friday morning, the US president said he is waiting for a final report he has ordered into a range of Russian hacking attacks, but promised there would be a response. However, it has been noted by many analysts, including those within the US' own foreign policy circles, that America's ability to retaliate with "cyberattacks" against Russia in such a manner would range from futile, to even galvanizing the Russian people further behind the Kremlin. In all likelihood, an attempted counter "cyberattack" would have ended in further humiliation and isolation for the United States' ruling circles. 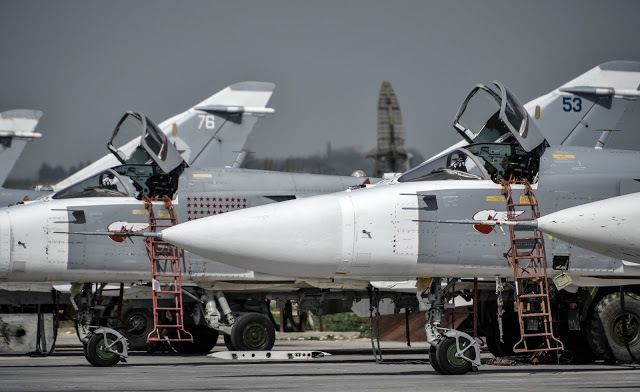 November 4, 2016 (Joseph Thomas - NEO) - Russian forces operating in Syria upon Damascus' request have met several close calls during military and humanitarian missions over the past two months. In late October, Syrian and Russian organised humanitarian corridors came under heavy fire in Aleppo in a brazen attempt by Western-backed militants to prevent civilians from crossing over into government-controlled western Aleppo. 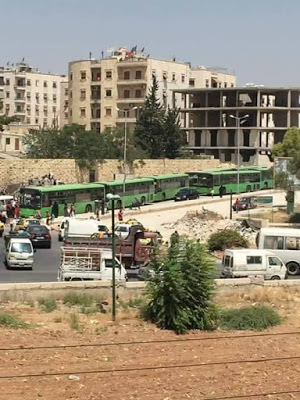 Buses ready to 'evacuate' civilians from east - so far no one has crossed. A rebel mortar just landed 50 ft from us. No injuries thank God. It is important to cite Western journalists present at the corridors dodging incoming mortars particularly because the incoming fire went otherwise unreported by the Western media. 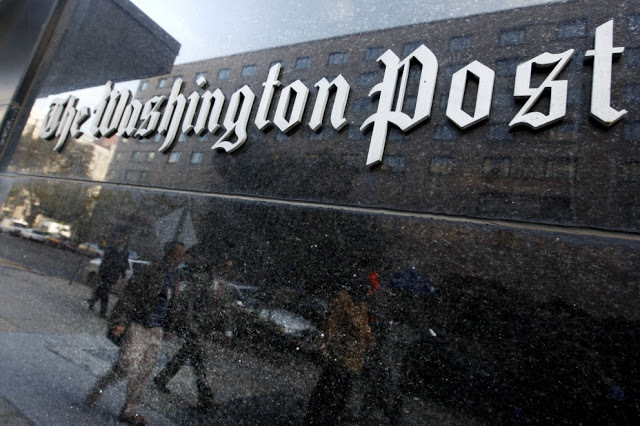 The Washington Post would allude to it in an article strategically titled, "Russia says Aleppo escape corridors under fire," in an attempt to make the claims appear to be baseless Russian propaganda. 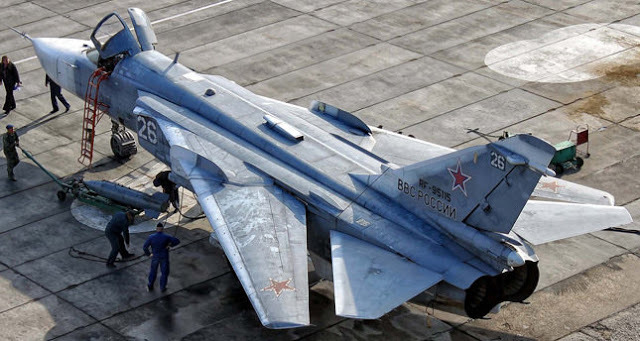 Russia’s Ministry of Defense confirmed militants hit one of its aircraft during a flight in Syria, but denied reports of any fatalities in the incident, Russian state news agency Itar-Tass reports. 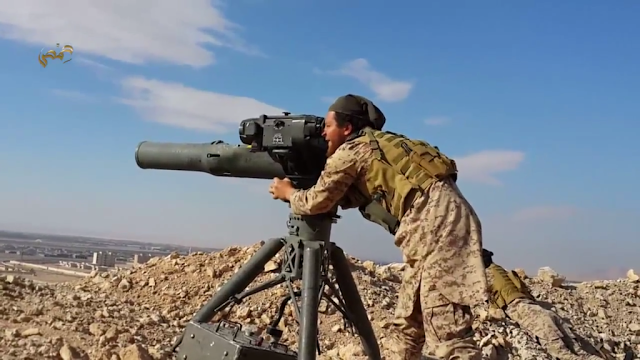 Extremist militant group Islamic State (ISIS) reported via their news agency Amaq they had destroyed a Russian attack helicopter in Syria’s Homs Governorate using guided missiles on Thursday, according to news website SITE Intelligence. The Russian government has come under heavy scrutiny for not upholding a ceasefire agreement and continuing military operations in Syria, in support of the Assad regime. Could these serendipitous setbacks for Russia simply be a coincidence? Or are they the manifestation of Western desires to remove Russia from the Syrian conflict by targeting its forces by proxy? Has CIA's Plot to "Covertly" Kill Russians in Syria Come to Pass? August 9, 2016 (The New Atlas) - Former acting director of the US Central Intelligence Agency (CIA) Michael Morell during a televised interview with American talk show host Charlie Rose, openly conspired to commit a raft of war crimes in Syria, suggesting that the US should take measures to "covertly" kill Russians and Iranians through armed proxies on the ground. He also suggested targeting Syria's senior leadership through a series of terrorist attacks in and around Damascus, according to CBS News. I'd give them the things that they need to both go after the Assad government but also to have the Iranians and the Russians pay a little price. When we were in Iraq, the Iranians were giving weapons to the Shia'a militia who were killing American soldiers. The Iranians were making us pay a price. We need to make the Iranians pay a price in Syria. We need to make the Russians pay a price. Yes. Yes. Covertly. You don't tell the world about it, right? You don't stand up at the Pentagon and say we did this. Right? But you make sure they know it in Moscow and Tehran. Morell's plans echo those laid out by other US policymakers, including those at the Brookings Institution. The second more recently was over territory in Syria's northwestern Idlib province controlled by US State Department-designated foreign terrorist organisation, Jabhat Al Nusra. 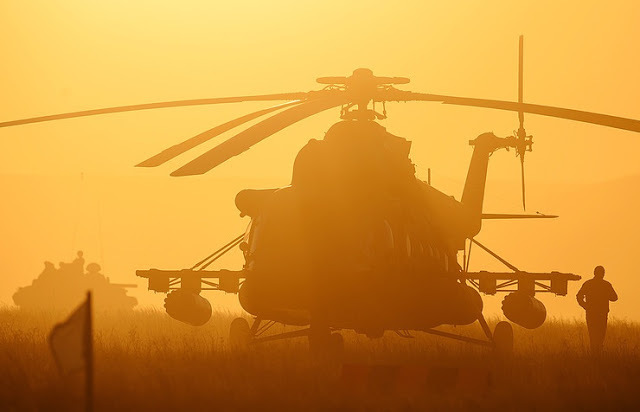 The helicopter was engaged in humanitarian operations relieving a town besieged by Western-backed militant groups. Both incidents appear to be the precise manifestation of Morell's admitted conspiracy to kill Russians covertly, with Moscow apparently having gotten the message, and subsequently relaying it to the rest of the world by linking the incidents to US-armed terrorist organisations. Indeed, the fight against terrorism does truly require Turkey's aid. 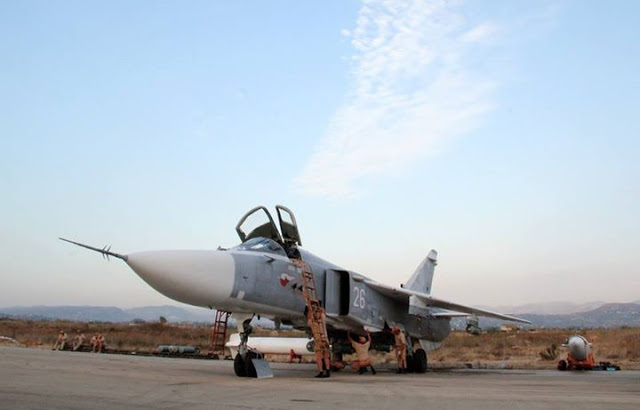 And its aid in this fight, particularly along the Turkish-Syrian border will serve as the true measure of Ankara's sincerity regarding its apology and regret for Russia's downed SU-24 warplane. In other words, Turkey's own government admits that Islamic State (IS) fighters, weapons and equipment are coming from Turkey, bound for Raqqa, which should make pundits, the press, politicians and the general public alike wonder why then Turkey along with its partners in the Persian Gulf, Europe and North America are fighting the Islamic State in Syria, rather than simply interdicting them within what is essentially NATO territory before they even reach Syria to begin with. On Friday, Defense Secretary Ash Carter called out Russia for bombing a Syrian rebel group that's backed by the U.S. The attack by Russian fighter bombers on American-backed opposition forces appeared to be deliberate and to ignore repeated U.S. warnings. Two American F-18 jet fighters were dispatched to provide air cover for the troops on the ground as they tried to evacuate their casualties. By the time the F-18s arrived, the Russian planes were headed away, but were still close enough to see. But when the F-18s broke away to refuel, the Russians returned for a second bombing run. 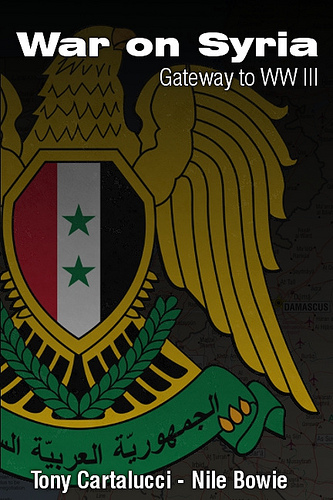 Another call went out to the Russian command center in Syria, demanding that the planes wave off. 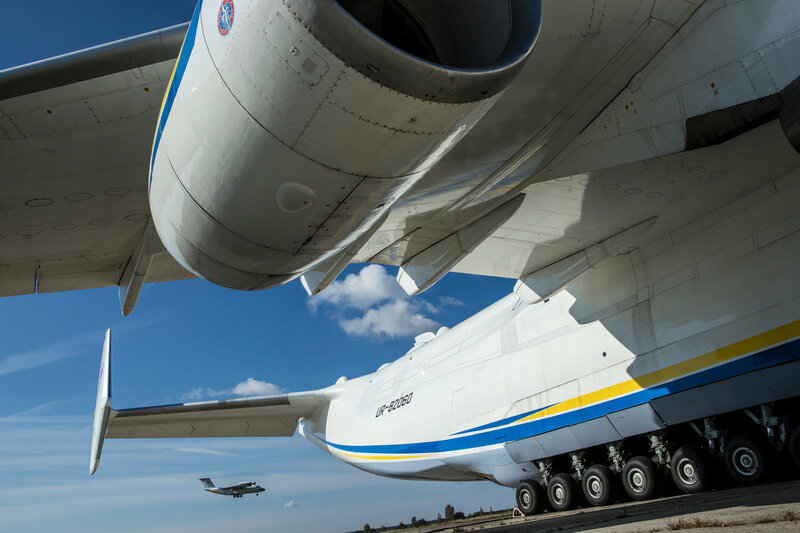 The crew of an airborne command post tried to contact the Russian pilots directly but got no response. The Su-34s conducted another bombing run, leaving a small number of opposition fighters dead on the ground. Neither CBS News nor the US Department of Defense ever explained why the US believes it is entitled to send armed militants over the borders and into a sovereign nation, or why it believes a sovereign nation and its allies are not entitled to confront and neutralize them or why US aircraft are entitled to fly over Syrian airspace without the authorization of the Syrian government. In other words, the US is vocally complaining about its serial violations of international law and norms finally (allegedly) being confronted and put to an end by Russian military forces. 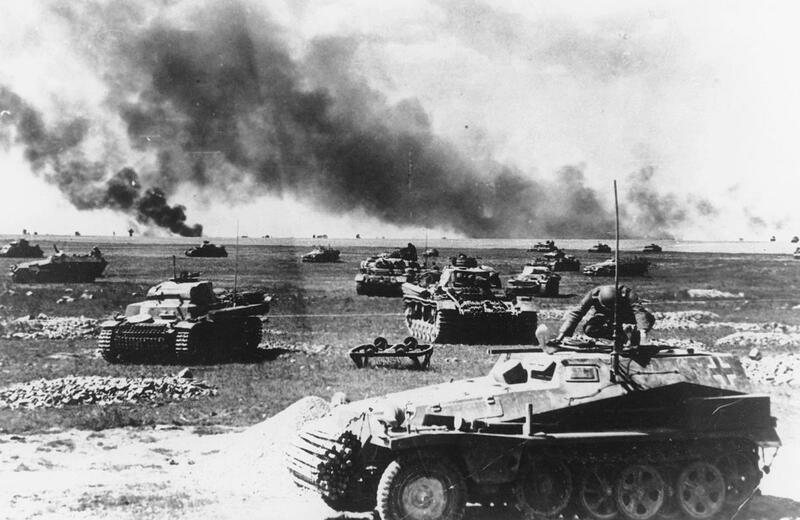 But Did Russia Even Attack America's Armed Invaders? Russia's Defense Ministry denied bombing U.S.-backed Syrian opposition forces in a recent military operation near the Jordania border, according to a statement released on Sunday. The Kremlin response comes after U.S. and Russian military officials held a video conference to discuss Thursday's strikes. As is characteristic of all US claims regarding its multiple, ongoing foreign acts of military aggression, the most recent row in Syria is heavy on rhetoric and light on evidence. Had Russia attacked armed militants invading Syrian territory, it would have been well within its rights to do so, however it has claimed it hasn't. The burden of proof is on the US. Turkey Wants to Normalize Relations With Russia - For Free? June 8, 2016 (Ulson Gunnar - NEO) - Every schoolchild knows that in order to makeup one must first offer a sincere apology. They must also be perceived as sincerely regretting whatever offense it was they committed, and show interest in not repeating such an offense or compounding it with similarly antisocial behavior. If such a notion is easily understood by a schoolchild, how come the President of Turkey Recep Tayyip Erdogan appears not to know this? To answer this question, one must read the narrative provided by the Washington-London establishment. Articles like the BBC's "Can Russia and Turkey heal rift?" provides useful insight. [Turkish President Erdogan] also said he wanted to improve ties with Russia but that he did not understand what kind of "first step" Moscow was expecting. Russia's President Vladimir Putin was clear about that: Moscow expects a formal and public apology from Turkey and also compensation for the jet incident. To explain why something so simple is not something Ankara is likely to do, the BBC would elaborate by explaining that there is no "international" pressure on Ankara to do so. For long-time readers of news services like the BBC, they will realize that the term "international" actually refers to the US, UK and EU exclusively. There is no pressure on Turkey from Washington, London and Brussels specifically because the downing of Russia's warplane over Syria was part of a wider proxy war these centers of power have been waging in Syria against both Damascus and ultimately against Moscow. As Russia maintained a de facto no-fly zone in northern Syria by the Turkish border, Turkey lost its ability to give air support to Syrian rebels or protect its borders from Islamic State (IS) militants' shelling. However, this is a transparent falsehood. IS has long been suspected of using Turkish territory as a safe haven and springboard into Syria. More recently, this has become painfully obvious and a point of humiliating contention for Ankara. Ankara is clearly being left holding the most toxic aspects of Washington's proxy war against Syria, including complicity in propping up IS. IS "shelling" into Turkey resembles less of a genuine threat to Turkish security, and more of an updated version of a conspiracy revealed by the International Business Tribune (IBT) in which Ankara planned to attack its own territory from Syria to help justify cross border military incursions into Syria by Turkish forces. 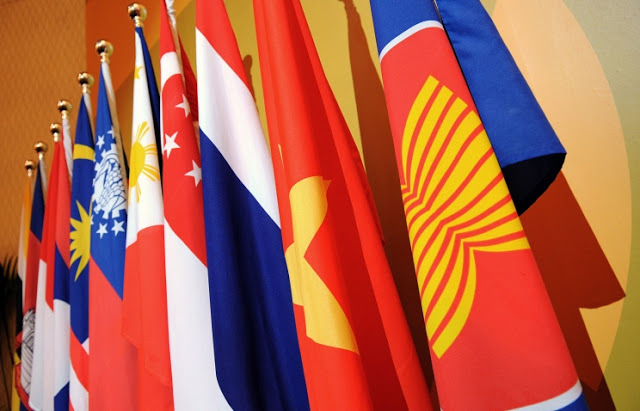 May 17, 2016 (Tony Cartalucci - NEO) - Earlier this year, despite immense fanfare, the US-ASEAN Summit held in Sunnylands, California ended in a fizzle rather than a bang. Little of substance emerged from and admittedly "symbolic" summit, and the US even went as far as criticizing guests as they departed - lecturing them regarding "democracy" and "human rights." Coupled with this send-off designed to humiliate, was the US State Department's various funded media fronts operating in each respective ASEAN state, mocking and denigrating ASEAN leaders who have fallen from Washington's favor. Far from another step toward fostering better relations between Washington and Asia as prescribed by the US "pivot to Asia," it was instead a transparent attempt to empty out the resources of the region via compromising and coercive free trade agreements - more specifically, the Trans-Pacific Partnership (TPP) - and line up an unwilling Southeast Asia as an adversarial proxy against Beijing - a notion none save for Washington attending the summit found appealing. Russia, unlike the US, does not possess extensive extraterritorial networks of NGOs dedicated to subverting and coercing foreign governments. It has no historical or current presence in Asia militarily, unlike the US who is permanently occupying Japan, building bases in the Philippines, and regularly provokes security crises in the South China Sea. Russia spends a fraction of what the US does on its military overall, and cultivates a multipolar, non-interventionist worldview in direct contrast to America's "intentional order" it places itself atop. May 4, 2016 (Tony Cartalucci - NEO) - The so-called "Pivot to Asia" serving as the current underpinning of American foreign policy in Asia has been repeatedly exposed as a continuation of a decades-old cynical region-wide US gambit to encircle and contain China while establishing military, sociopolitical, and economic hegemony over China's neighbors, particularly those in East and Southeast Asia. 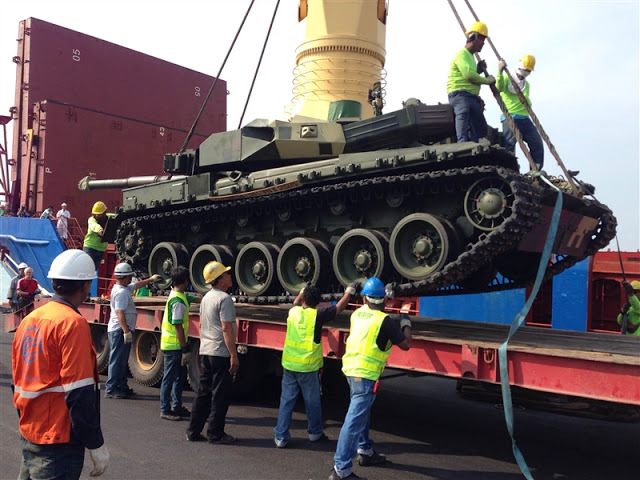 Other nations, including Malaysia and Indonesia have encountered increasing hostility from the "pivoting" United States as they choose closer ties to China in exchange for infrastructure and meaningful economic relations versus the West's non-negotiable "free trade agreements" and one-sided military "partnerships." 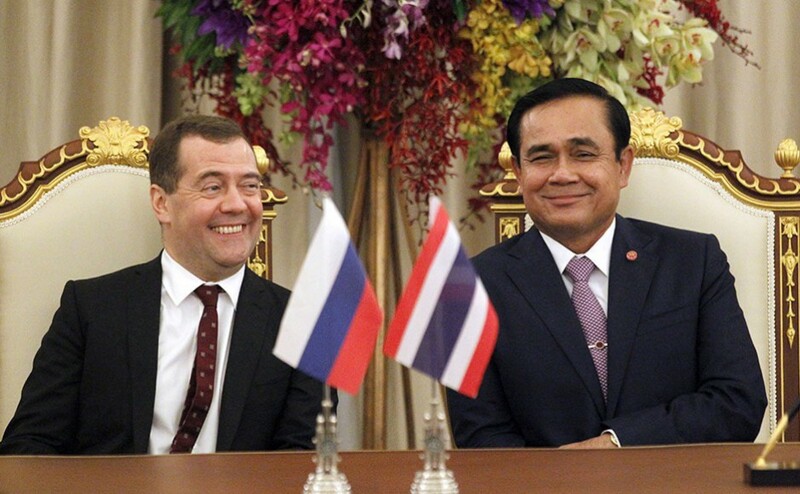 Thailand finds itself geographically, historically, and geopolitically at the center of this "pivot." Historically, Thailand remains the only Southeast Asian state to avoid European or American colonization. It has accomplished this by striking a delicate balancing act between various opposing hegemonic forces in the region. 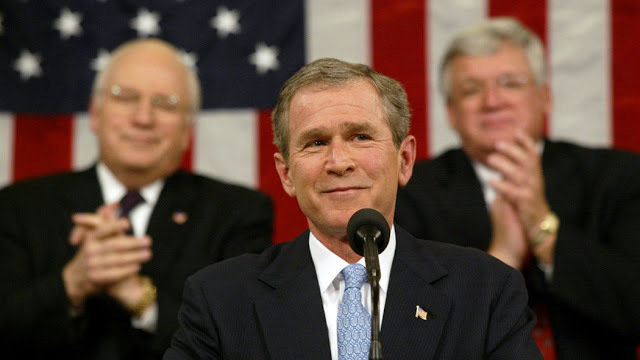 During Shinawatra's time in power, he would serve Western interests well - sending Thai troops to participate in the unpopular and illegal US invasion and occupation of Iraq in 2003, hosting the CIA's atrocious rendition program on Thai soil, and attempting to ramrod through a US-Thai free trade agreement without parliamentary approval. 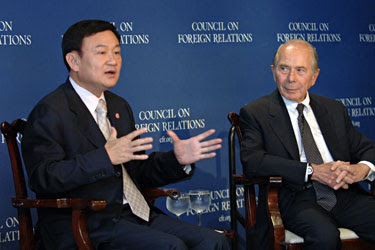 Since Shinawatra's initial removal from power in 2006 and up to and including today, he has received unswerving support from some of the largest lobbying firms in Washington including his former Carlyle Group associate James Baker, Barbour Griffith & Rogers, Robert Amsterdam, and notorious Neo-Conservative Kenneth Adelman. It is clear that the US seeks to put Shinawatra back into power, or at the very least, use his political front to divide and weaken Thailand as much as possible to gain additional regional leverage. 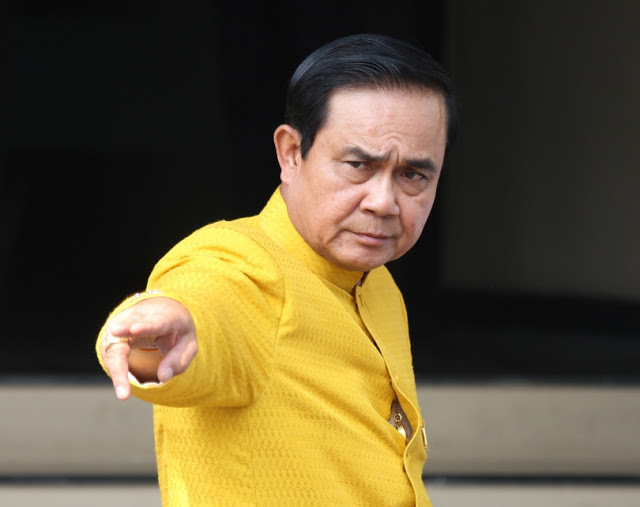 Thailand now finds itself at the end of a US-European campaign to isolate and shame the nation for dismantling the foreign-backed political networks of Thaksin Shinawatra. Western headlines portray Thailand as an international pariah, when in reality, its increasingly closer relations with Bejing alone equates to the support of a nation that - by itself - represents more people than the US and EU combined. But Beijing is not Thailand's only potential ally. There is another.